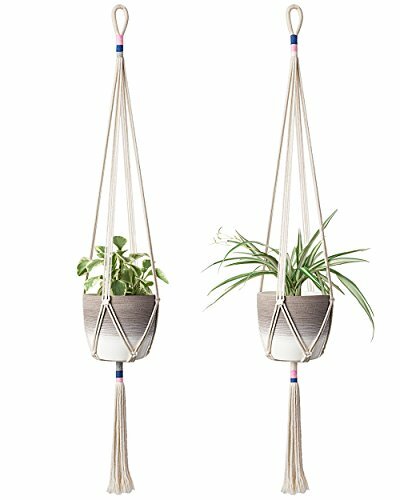 This plant hanger is great for displaying your beloved plants such as succulent, cactus and herbs, it may be hung inside or outside to adorn your home, garden, patio or office. It looks wonderful on its own, or can be clustered together with other plant hanger. This item are completely handmade with boho design. Suitable for a housewarming gift or giving this for yourself. This wall hanging planter is ideal for displaying your favorite plants such as succulent, cactus and herbs etc. Simple, yet meticulously handcrafted, this beauty would be gracing your home or balcony garden, or brightening up an office. Material: Cotton. Sturdy and durable, and easy to install. The props and planters are not including in this item! You can save space and beautify any indoor or outdoor corner spaces. A thoughtful gift for your friends and family who are inspired by nature. As a beautiful boho piece this plant hanger will surely add a touch of modern artistry to your room decor. Size:43" Length. Mkono is a registered trademark and our product is professional manufacturing and sole selling.